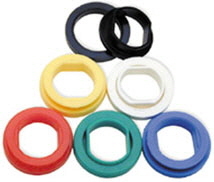 Strain Relief Bushings/ Cable Bushings & Cable Clamps for Round and Flat Cables, plastic cable bushings, nylon cable clamps, etc. We offer custom and off-the-shelf, standard strain relief bushings/ cable bushings & cable clamps for a wide range of electronic and low voltage electrical cable assemblies. We also offer strain relief bushing design, engineering and molding services. Vibration Absorbent Bushings; cushions and insulates cables, tubing, hoses or shafts tc. E-mail or Call us Today for Strain Relief Bushing and Cable Clamp Solutions!